Here's a fun knitting class for determined beginner or intermediate knitters. This striking shawl is nearly triangular with a beautiful center lace panel that makes it flow gracefully and eliminates the point. You can use any weight yarn you want to use. 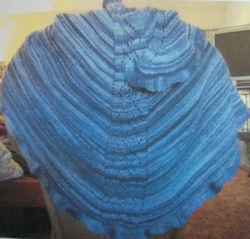 The model was made with DK/Sport weight yarn. Call us today to reserve your spot, space is limited.